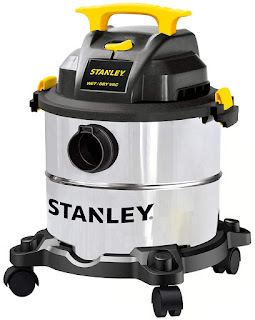 Right now over at Amazon you can score this Stanley 5-Gallon Wet Dry Vacuum Steel Tank for just $36.43 shipped (Retail $59.99)! This 5 gallon steel container has a rear blower port and a 10-foot power cord with a built-in cord wrap. The swiveling casters provide ease of movement and it comes with a 5-foot hose, two extension wands, crevice nozzle, gulper nozzle, floor brush, foam filter, cloth bag with clamp ring, and a dust bag.